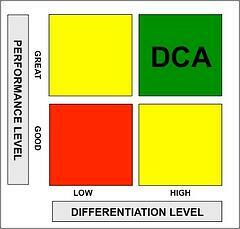 To win, you must have a Differentiating Competitive Advantage (DCA). Every company does lots of things. Sadly, most never become truly great at anything. For those of you who have not yet read Dave Ramos' book, Decide One Thing, we will summarize it in One Sentence: you must be good at lots of things, but the way to win is to become differentiatingly great at One Thing. That is why we advise companies to pick ONE corporate competence and make it your One Thing. Most companies cannot honestly fill in that blank. After all, only One Company can be the best in the world. Step One is to choose something that your company could indeed become the best in the world at. And of course, there are many things that you can choose. Step two is to align everyone—and everything—with your One Thing. After all, becoming the best in the world will require intense focus and disciplined investment. This is what turns your One Thing into a Differentiating Competitive Advantage. We believe this is the most important component of creating alignment. Unfortunately, most companies do not have the discipline to Decide One Thing. That is why they can have visions, missions, values, and strategies … and still be massively misaligned. Therefore, we strongly recommend that you lock this down before working on your vision, mission, values, strategy … or anything else. Every corporate strategy textbook espouses the importance of creating a competitive advantage. So, why do so many companies struggle? We believe that the competitive advantage frameworks in textbooks are too theoretical and complex. To address this problem, SHIFTPOINTS developed a simple 2x2 matrix to illustrate how companies can create a competitive advantage. We always start the Decide One Thing process by suggesting that clients use price as their Differentiating Competitive Advantage. That’s why we call it Option One. The low price strategy is always a viable option. In every market, there are customers whose dominant buying motive is price. Above all, these customers want to save money, and are willing to sacrifice other things, such as convenience, features, or even quality, to do so. Walmart used the low price strategy to become the world’s biggest retailer. Southwest used low fares to become the largest airline in the US. Vanguard leveraged low fees to build one of the world’s largest investment companies. Geico’s “15 minutes could save you 15% on car insurance” slogan is so ubiquitous that now they don’t even bother to finish the sentence. Counter-intuitively, these companies are also amazingly profitable because they have developed a business model that is optimized to serve the low-price segment. They are obsessive about cost control, supply chain management, and purchasing. These disciplines allow them to compete at price points that competitors can’t match. If you are not going to win by being cheaper, you must find a way to be better. Better enough to justify the price premium. So, if you are 20 percent more expensive than the lowest price alternative, you have to deliver at least 20 percent more value. The Decide One Thing process is one of discovery and exploration. We suggest that you start with price. Once you rule that out, we can explore the rest of the forty sources. Copyright © 2019, SHIFTPOINTS, Inc. All rights reserved.